Former football star O.J. 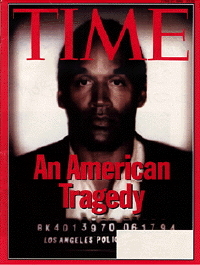 Simpson was charged with the murder of his ex-wife Nicole Brown Simpson and her friend Ron Goldman. After a widely publicized slow-speed pursuit, Simpson was taken into custody by the police, who then released Simpson's mug shot to the media. The harshness of the mug shot -- the merciless bright light, the stubble on Simpson's face, the cold specificity of the picture -- had been subtly smoothed and shaped into an icon of tragedy. The expression on his face was not merely blank now; it was bottomless. However, many people responded to the cover far less charitably. Critics charged Time with racism, claiming that by darkening Simpson's features the magazine had emphasized his skin color and gave him a more "menacing" appearance. Benjamin Chavis of the N.A.A.C.P. argued that the cover made Simpson seem like "some kind of animal." Journalists suggested that, since the mug shot was a news photo, it should never have been altered at all. 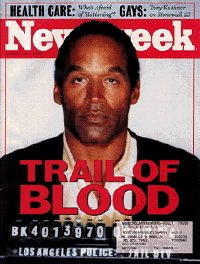 Unfortunately for Time, its rival Newsweek ran the same mug shot on its cover (bottom) that week, without altering it. The two covers appeared side-by-side on newsstands, making Time's decision to darken the photo far more visible. Time later issued an apology to its readers. Gaines, J.R. (July 4, 1994). "To Our Readers." Time.